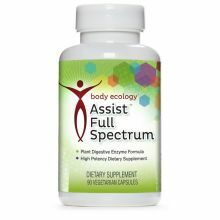 Assist Dairy and Protein is a high potency blend of Enzymes, pepsin and HCI, which all play a major role in the digestion of Animal protein, eggs, dairy and nuts and seeds. Taken before each protein containing meal, Assist Dairy & Protein can dramatically improve digestion and absorption of all protein sources, helping to eliminate gas and bloating. Contains NO wheat, NO soy, NO artificial colors, NO artificial flavors. NO ANIMAL PRODUCTS. NO fillers or excipients.